S. by J.J. Abrams and Doug Dorst. Mulholland Books, 2013. Hardcover. 456 pages. I read this book back in July, but I've had a review stewing within me for a while and I also feel like I've seen this book around a bit more lately, so I thought I would go ahead and put up my own review of it. I'll also include a few pictures that highlight the aesthetic and format of this book. In short, this book is... a bit crazy. But it's also captivating. 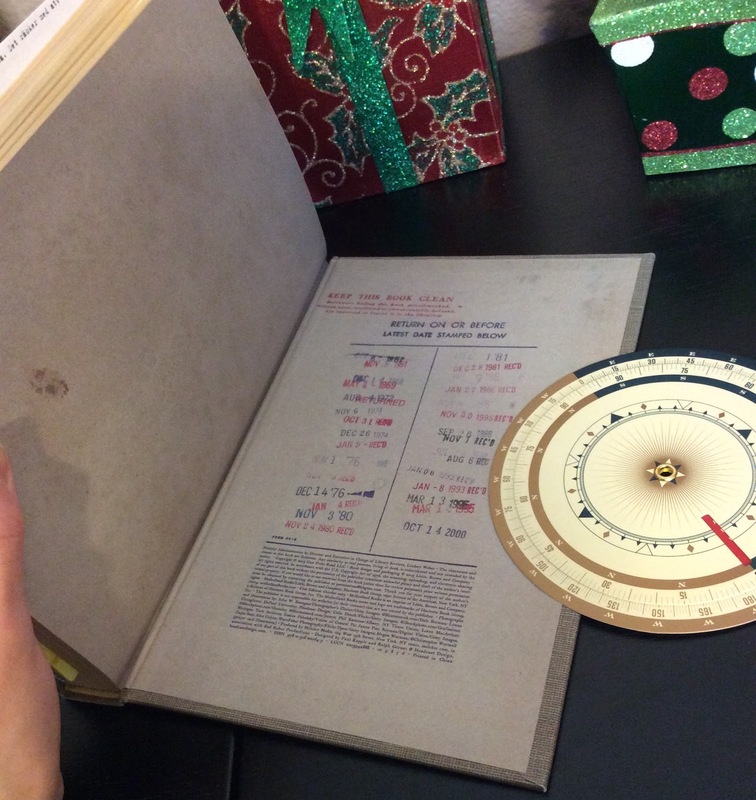 The book itself comes in a lovely slipcase cover and is designed to look like an old used library book. Ignore the Christmas decor. Admire the beauty of S.! I will try to explain the very basic premise of the story to the best of my abilities, but bear with me. 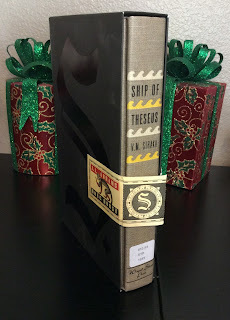 The general plot is that there is a young woman--a soon-to-graduate college senior--who stumbles upon a book called Ship of Theseus one day in her college library, and in it she also finds notes in the margins from a grad student who is studying the book. The fictional author of Ship of Theseus is V.M. Straka, an incredibly secretive and mysterious author whose identity is unknown. The two soon begin writing notes back and forth in the margins, notes that are at first fairly simple and conventional, but eventually the two begin to unearth and develop deeper theories and conspiracies that surround the book, its contents, and its author. In addition, the two slowly become closer and closer and develop a much deeper relationship as a result. The first area of this book that I will discuss is the format, which I will then follow with a review of the content and my overall thoughts about this book. To begin, I found this entire concept to be rather brilliant, if we're being honest. 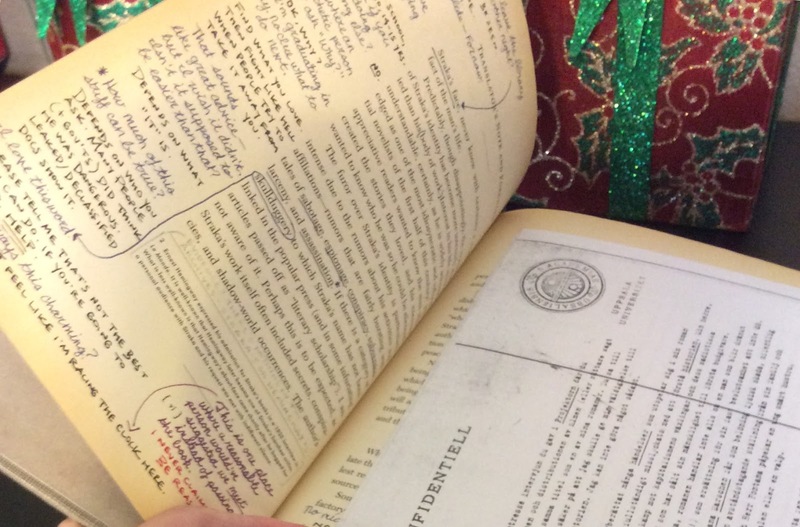 I thought the marginalia idea was incredibly clever, and I also have a special interest in books about mysterious books and authors, so this completely hit all of my interests. The reason I was so drawn to the margin notes in this book is because I love reading other people's notes about things, so this just sort of rolled that interest up with an already fascinating storyline, which created a really inventive book. Honestly, I'm still not even sure what the heck that circle thing is, but whatever. One particular thing about the margin-writing that I had mixed feelings about, however, was the usage of different colored pens. In general, I'm impressed by the idea of using different colors/thicknesses of pens/markers to note the passing of time and give an idea of what notes were added first versus what notes were added most recently by the characters. On the surface, I loved this. But as I progressed, I became unsure: should I read the old notes first and go back and read the later ones? does it matter what order? will reading the recent notes spoil something? And the conclusion I came up with was this: it doesn't matter! I don't actually know if the authors intended it to be read a certain way or not, but personally, I think this book is meant to be an experiment that is unique to each reader. I tried reading only the older notes at first, but I soon realized that that was too frustrating and I ended up just reading them all together on the same page as I came upon them. Another reading issue that presented itself was whether one should read the text of Ship of Theseus itself an then go back and read the notes or if one should read the text and marginalia of each page at the same time, so I experimented with this. I tried reading the text and the marginalia all at the same time, but this quickly became a bit too disjointed and confusing to keep track of everything. What I ended up doing was read the text of an entire chapter, then going back and reading the marginalia of that chapter. It was still a bit odd, but it worked best for me and I was able to better keep up with the story. And now that I've discussed the format and reading experiencing at length, let's move on the story itself! I have incredibly mixed feelings. The story overall is thought-provoking and definitely made me continue to want to know what was going to happen. 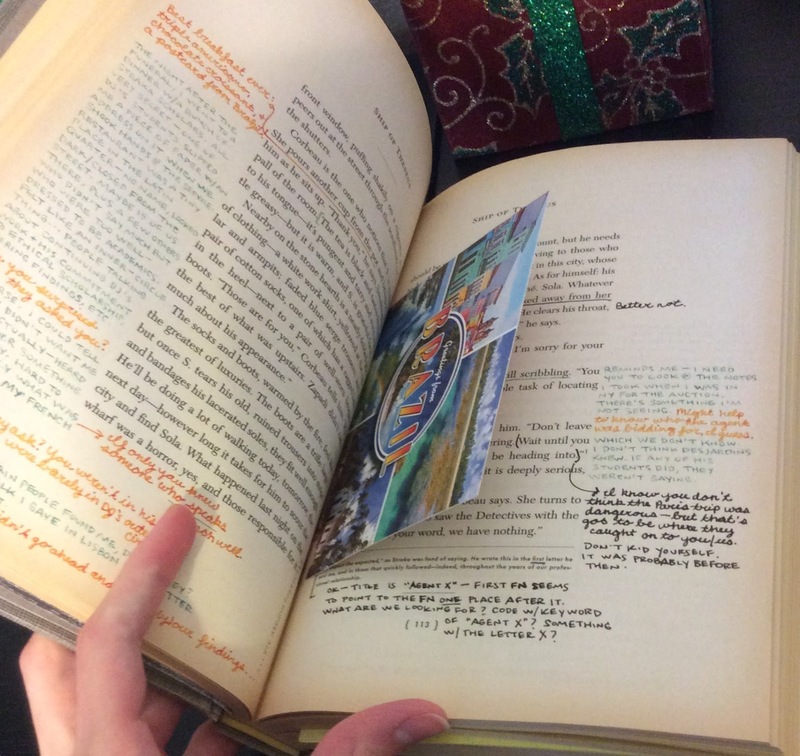 Without question, I preferred reading the marginalia far, far more than the story told in Ship of Theseus. Ship of Theseus was, frankly, such a bore at times. I was interested in it in the beginning, and there were a few interesting parts in it, but overall... it was hard to get through. Ship of Theseus is not a very action-heavy text and it relies much more on character intrigue and a lot abstract mysterious happenings that I just couldn't get into. That being said, it is still absolutely the kind of thing that I can see a lot of people enjoying, so I would still recommend giving it a chance. I just didn't have the patience at the time to enjoy it for some reason; it is something that I might go back to one day to reread, but for now I am just leaving it at my being disappointed by that text. As I mentioned, however, the story told in the margins by the two students, Jennifer and Eric, was much more interesting. In their discussions, they deliberate over their search for the identity of Straka and the entire conspiracy that seems to surround Ship of Theseus and those involved. They also begin to discuss more and more personal issues that add so much to this novel--it really becomes almost thriller-like in the suspense that is created. 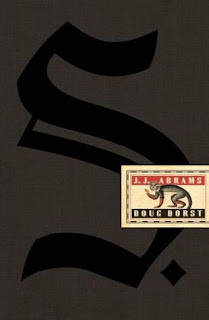 The writing of this book was extremely well-done and it is incredibly obvious that Abrams and Dorst are talented men--there is no doubt about that. Despite the text of Ship of Theseus not completely grabbing me, I still found myself rather enthralled by S. Some might say its gimmicky, but I don't think it was meant to be. I found it to be an truly interesting book format experiment that developed into a great story and conspiracy to attempt to figure it out. And, of course, it's one of those books that leaves much unsaid and up for reader to discuss. And they do, because I have seen specific forums and the like dedicated to fans of this book. Overall, I gave S. four stars! I highly recommend it if you are looking for something a little different and incredibly intriguing. Labels: book review, bookreview, books, doug dorst, fiction, j.j. abrams, jjabrams, s, s.